Whether you like an all-veggie salad or one that’s heartier thanks to a variety of additions like chicken or apples, Massachusetts’ salad bars know how to turn a simple salad into a serious meal. Next time you’re craving some leafy greens, check out these 10 spots in the state. Topp Salad wants healthy eating to be easy and accessible. They started their company in Danvers in 2015, when they realized there was a need for healthy fast food. And while you don’t go to a drive-thru to get your salad, when all the fixings are prepared and presented in a creative, palatable way, it makes for a pretty fast alternative. Located in an old train depot, the Beverly Depot has one of the best salad bars in the state. Choose from countless offerings, locally sourced when available. Whether you enjoy it as a meal or as an accompaniment to an entrée, you’ll find this to be a salad bar extraordinaire. Family owned and operated for 20 years, Foodie’s Markets owners pride themselves in their salad bars. Pick one up to take home for dinner. Grab one on your way to work. The fixings are crisp and fresh all day long. With produce sourced from local farms in season and employees dedicated solely to making their salad bar enticing and delicious, this is a hard meal option to beat. Even though most folks visit Brazilian Grill for the delectable meats, most wind up raving about the salad bar as well. In fact, so many indulge heartily in the salad bar and can’t finish their meal—making for many takeout containers on any given night. Always super fresh, cold and crisp, the fixings are too tempting to pass up. People drive from Boston to Medford on a regular basis to enjoy the salad bar at Oasis Brazilian Steakhouse. The modest price and large selection of fresh veggies, meats, pasta salad, cheeses, toppings and more are the reason why. Served solo or with an entrée, there’s enough offered to make an entire meal of their salad bar. All you can eat meat—carved tableside—and a salad bar make for a frequent wait at Fogo de Chao Brazilian Steakhouse. And while it’s the meat most patrons come for, the salad bar always gets exceptional reviews. Refreshed frequently throughout the dinner hour, it always features multiple unique items like roasted hot peppers, plus lots of typical salad bar fare. Yes, it’s a market, so you’ll have to take your salad to go. However you’ll be hard pressed to find another market with a salad bar this fresh and extensive. Starting as a produce market in the 1960s, Lambert’s knows produce. Now they incorporate that knowledge into a salad bar that’s hard to beat. They use locally sourced veggies and fruits when the weather allows. Open April through October, Van Rensselaer’s Restaurant & Raw Bar has a fabulous salad bar. A perfect addition to fish, shellfish, steaks and prime rib, it is known as the freshest salad bar on Cape Cod. Hearty enough to be a complete meal, many regulars return summer after summer for the salad bar alone. 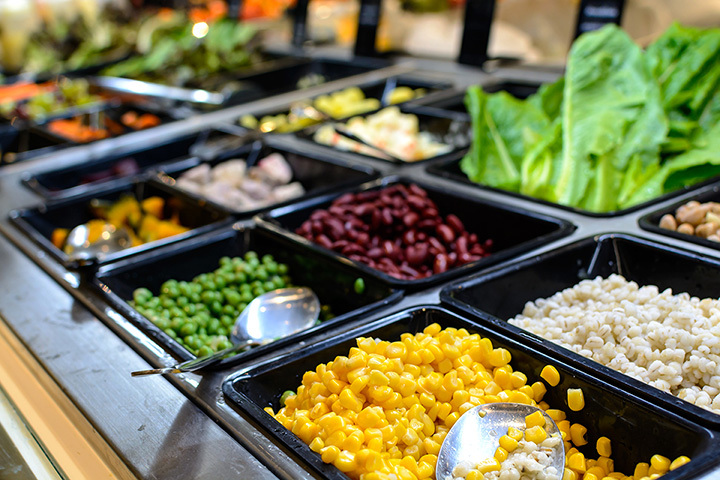 The salad bar at Danvers Fresh Marketplace is known throughout the North Shore. Many customers stopping in for just a few staples or recipe ingredients see the salad bar and can’t help themselves. They simply must make a salad from the fixings on display and take it home with them. An abundance of veggies, fruits, cheeses, toppings and more make up this incredibly fresh salad bar. Choose from one of two salad bar options at Sebastian’s. The Unlimited features your choice of greens, unlimited classic toppings and a choice of salad dressing. The Basic includes your choice of greens, up to five toppings and a choice of salad dressing. Not so hungry? Go for the basic. Want a hearty dinner salad? Go for the Unlimited.